IoT application development presents an enormous opportunity to reshape entire industries. According to McKinsey & Co, the merging of the physical and digital worlds via IoT could generate up to $11.1 trillion a year in economic value by 2025. Your organization may be wondering how to harness IoT to improve operations and deliver differentiating products and services. This requires building IoT applications or software that combine sensor data with predictive analytics and machine learning technologies to create intelligent, context-aware and proactive user experiences for your employees, customers and partners. However, building these types of IoT applications—or Smart Apps, as they’re often called—can be challenging. IoT application development requires many, disparate technologies. IoT solutions are typically composed of a complex, heterogeneous mix of IoT endpoints, platforms, back-end systems and data (e.g. sensors, actuators, processors, embedded software, local and long-range connectivity, middleware, apps, analytics, machine learning, etc.). In addition, building IoT applications requires scarce, hard-to-find specialist skills. Developers must not only be versed in their organization’s IoT platform and its underlying services but also understand the big data and machine learning technologies required to make sense of real-time data streams. At the same time, because IoT represents uncharted territory, they must collaborate with the business to experiment with new ideas and bring new solutions to market through rapid iteration. This all results in a lot of time and effort to build IoT applications. On top of that, the accelerating pace of change is making it hard for enterprise IT teams to keep up with new capabilities and advancements. Visit the App Gallery for a live example of an IoT enabled smart app. The Mendix Platform is the fastest and easiest way to build IoT software and applications. The platform’s visual, model-driven approach enables both pro and less technical developers to consume IoT services from best-in-class IoT platforms, including AWS, IBM Watson, Microsoft Azure and KPN LoRa. Through this platform-agnostic strategy, Mendix enables organizations to build rich experiences on top of connected devices to transform their operations, products and business models. Internet of Things employs smart devices and sensors to be utilized by software, databases and applications connected by the internet. Users then view the information via display or interact with the data with a user interface. The top IoT development platforms provide an intuitive way to produce IoT enabled software and applications. This is done by providing easy ways to integrate sensors and smart devices into the application development cycle. Mendix is one such platform. Creating an application is a multi-step project that includes planning, development, feedback and deployment stages. Using a low-code IoT enabled development platform like Mendix makes the process faster and more efficient. IBM Watson IoT is a powerful platform that combines sensors, smart devices, databases, software and user interfaces to create smart apps and software. 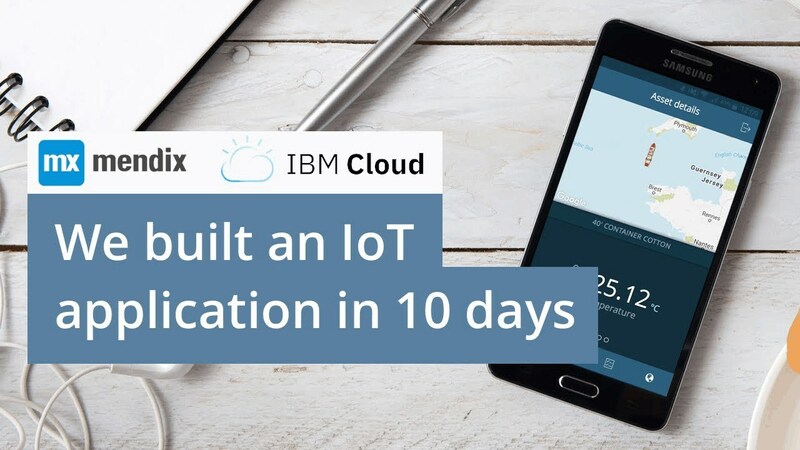 Mendix is fully compatible with IBM IoT Watson at the click of a button, enabling efficient, agile software development.